Date to be announced! We’re re-running, by popular demand, the first iBooks Author webinar – “iBooks Author – The Future of Learning” where iBooks Author expert Elaine Giles will show you how to build an interactive book using iBooks Author. Elaine has been creating training materials for over 20 years and she has also, within days of the iBooks Author software being released, created an iBook that showcases all of the features of the application. Subscribe to the MacBites Learning newsletter to be the first to find out about this and all our other webinars! Did you miss the webinar? Do you need to get up to speed with iBooks Author? 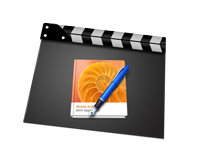 The MacBites Learning iBooks Author video collection contains recordings of our iBooks Author webinars. On 8th March 2012, Elaine Giles delivered a webinar “iBooks Author – The Future of Learning” in which she demonstrated how to build an interactive book using iBooks Author. As an experienced IT Training Consultant, Elaine has been creating training materials for over 20 years and as soon as the software was released by Apple, she set herself a task of building an interactive book that showcased all the features of iBooks Author. The book, which is almost 100 pages, was used as a case study during the webinar and is also available as a free download. On 29th March 2012, Elaine Giles delivered a webinar “Creating iBooks Author Templates” in which she demonstrated how to customize the included templates and build your own templates from scratch using iBooks Author. As an experienced IT Training Consultant, Elaine has been creating training materials for over 20 years and as soon as the software was released by Apple, she set herself a task of building an interactive book that showcased all the features of iBooks Author. The book, which is almost 100 pages, was used as a case study during the webinar and is also available as a free download. On 19th April 2012, Elaine Giles delivered a webinar Creating Interactive Content for iBooks Author in which she demonstrated how to create interactive elements that can be incorporated in to any iBook you create. The range of content was amazing, as demonstrated by the list of areas covered. As an experienced IT Training Consultant, Elaine has been creating training materials for over 20 years and as soon as the software was released by Apple, she set herself a task of building an interactive book that showcased all the features of iBooks Author. The book, which is almost 100 pages, was used as a case study during the webinar and is also available as a free download. On 3rd May 2012, Elaine Giles delivered a webinar Creating Photobooks in iBooks Author in which she demonstrated features useful in the creation of Photobooks in iBooks Author. As an experienced IT Training Consultant, Elaine has been creating training materials for over 20 years and as soon as the software was released by Apple, she set herself a task of building an interactive book that showcased all the features of iBooks Author. The book, which is almost 100 pages, was used as a case study during the webinar and is also available as a free download. On 10th May 2012, Elaine Giles delivered a webinar Create an Interactive Adventure in Keynote in which she demonstrated how to create interactive presentations that can be incorporated in to any iBook you create. Elaine demonstrated how to create iBooks Author Zoo a fully immersive and embeddable presentation and followed this by creating a 3D Timeline in Keynote. On 24th May 2012, Elaine Giles delivered a webinar Working with Data in iBooks Author in which she demonstrated how to create stunning tables, charts, graphs and timelines that can be incorporated in to any iBook you create.